22,430 repentant cultists surrender arms in Rivers – Royal Times of Nigeria. 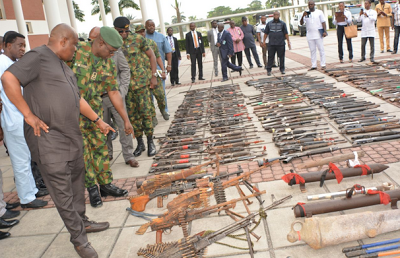 Governor Nyesom Wike of Rivers on Monday said that the State’s amnesty programme witnessed 22, 430 repentant cultists surrendered 911 assorted arms to the amnesty Committee. Wike said this at a Town Hall meeting and accountability Forum to mark his administration’s second year anniversary in Port Harcourt. The governor noted that the programme had also resulted in surrendering 7,661 assorted ammunitions and 147 explosives by the repentant cultists. He stated that the amnesty programme had reduced cult related violence and other criminal activities in the state.